This incredible book answers children's probing science questions. "Where does light come from? ", "Can I feel forces? ", "What is my body made of? ", and more, this book covers subjects such as the living world, the human body, the material world, energy, forces and movement, and our planet with colorful pages and a fun question and answer format. It focuses on the subjects that kids really want to know about and the questions they ask, helping them easily learn new information. 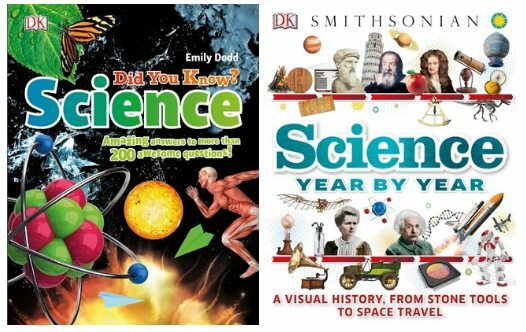 This amazing science encyclopedia is packed with information that supports the STEM (Science, Technology, Engineering, and Math) curriculum. Packed with fascinating discoveries and facts, this visual reference takes kids on a fantastic journey through time, from stone tools and simple machines to space travel and robots. Easy-to-follow illustrated timelines of pivotal scientific developments explore the ideas, experiments, and technologies that have shaped our daily lives over the past 3 million years. With more than 1,200 images, in-depth explanations of key inventors and innovations, quotes from groundbreaking scientists like Marie Curie, and stunning "moment in time" images of key events such as the first human landing on the moon, kids are sure to be amazed on every page. Young readers can learn about the early understanding of gravity, the discovery of dinosaur fossils, the first open heart surgery in human history, and much more. Created in association with the Smithsonian Institution, Science Year by Year will fascinate kids as they go on an amazing journey through time, tracing key moments in the history of science and technology along the way.